Sunny skies on Saturday will give way to a potential for strong thunderstorms overnight, and a continued chance of stormy weather on Sunday. 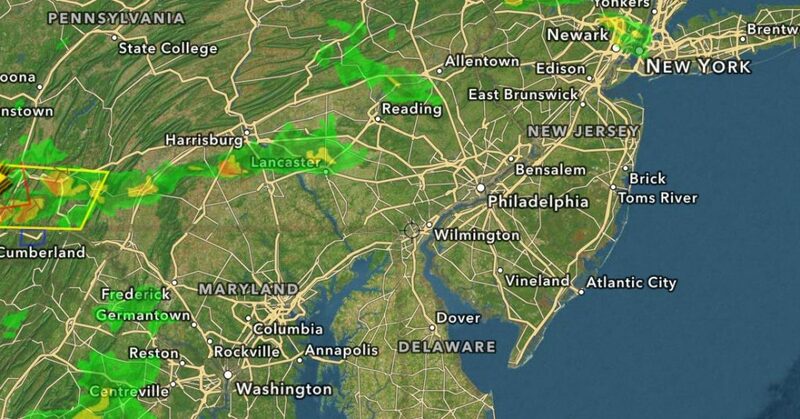 By 7 p.m. Saturday night, storms detected on the radar in Pennsylvania were beginning to inch closer to New Jersey. A coastal flood advisory was in effect for Ocean County between 6 p.m. Saturday night and 12 midnight. Minor tidal flooding was expected with the evening high tide, the advisory said, and those on the barrier islands of mainland bayfront were being advised to keep their cars away from areas prone to flooding. According to a forecast from the National Weather Service, scattered showers and thunderstorms will be present in the Shore are Saturday night. Generally, there will be less than a tenth of an inch of rain, except for areas which receive a localized severe storm. Scattered showers and thunderstorms will linger before noon Sunday, then showers likely and possibly a thunderstorm between noon and 1 p.m., then scattered showers and thunderstorms after 1 p.m., the forecast said. Some storms could be severe, with damaging winds, frequent lightning, and heavy rain. It will other be cloudy, with a high near 74. Showers and thunderstorms are also likely Sunday night before 1 a.m. Monday, then a slight chance of showers will remain. Some storms could be severe, with damaging winds, heavy rain, and frequent lightning, the NWS forecast said. The sun will return Monday, with a high near 80.